Globe Telecom recently widened its scope of services in the global arena with the creation of Globe Mobile Italy S.r.I. (GMI), making it one of the members of the Globe group of companies. GMI will handle the offering of various telecommunications services such as voice, SMS, MMS, load top-up and mobile data in Italy. With this development, Italy becomes the sixth country where Globe currently has a robust retail presence, which also includes the United States, the United Kingdom, Singapore, Hong Kong and Saudi Arabia, extending its footprint to more countries and empowering Filipinos to be even more connected across borders. 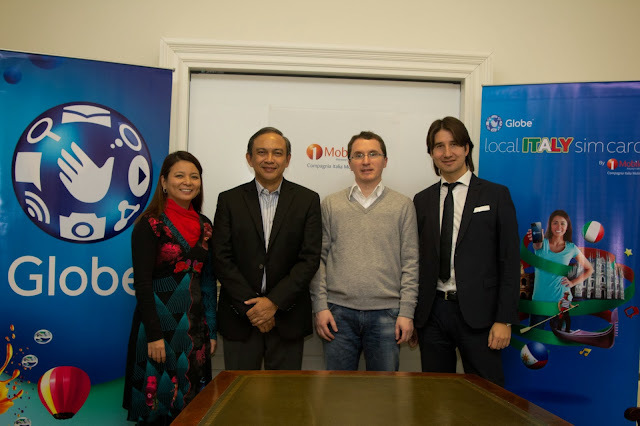 Coinciding with the establishment of GMI is the launch of the Globe local Italy SIM, a prepaid mobile service powered by the synergy between leading Italian mobile network virtual operator Compagnia Italia Mobile S.r.I., and network enabler Effortel Technologies, a Belgium-based network enabler company. “The Filipino community is known to be one of the most numerous and organized in our country, and though it is well integrated into Italian society, they keep alive the sense of belonging to their homeland. From now on, communicating with the Philippines through the Globe local Italy SIM will make them feel closer to home," said Antonio Cortina, CEO of Compagnia Italia Mobile S.r.l. About 200,000 Filipinos living in or visiting the Italian Republic can now use this Globe local Italy SIM for their daily communication needs, having access to competitive domestic mobile rates as the service offers bundles that include all net voice, all net SMS and mobile data. In addition, they can keep in touch with friends, family and associates in the Philippines. With 5 euro cents per minute, it is the most affordable service from an Italian mobile operator for calls to Globe and TM subscribers in the country. Italy-based Pinoys can also have access to competitive domestic mobile rates as the Globe local Italy SIM offers bundles which lets them call and exchange SMS to all Italian mobile networks as well as connect to the internet with affordable mobile data charges. “Globe aims to provide the best connectivity offers to over 11 million Filipinos overseas. We are pleased to be able to introduce the Globe brand of service to Pinoys in Italy, making it more affordable to keep in touch with family and friends back in the Philippines,” said Gil Genio, Globe’s Executive Vice President and Chief Operating Officer for International and Business Markets. To know more about GMI, visit www.globemobile.it. PHOTO CAPTION: Italy-based Pinoys get Globe-connected: Globe SVP for International Business Rizza Maniego-Eala, Globe EVP and COO for Int’l and Business Markets Gil Genio, Effortel Technologies Founder and CEO Arkadi Panitch and Compagnia Italia Mobile CEO Antonio Cortina lead the establishment of Globe Mobile Italy S.r.I., which also introduced the Globe local Italy SIM over the weekend in MiIan.